Payroll is no one’s idea of fun, but for caterers and other event-based companies, it can be a headache of monumental proportions. Why? Caterers work a different schedule every day, employ a mix of full-time and part-time staff, and often have people work multiple positions at different wage rates within the same pay period. So, when it’s time to run payroll, HR managers have to spend hours parsing through paper timesheets, manually adding up everyone’s hours, and double checking for mistakes. But it doesn’t have to be this way. Caterers large and small are saving themselves hours a week on payroll using workforce management software that combines their company’s staff list, work schedule, and time & attendance data. Having each component on a unified platform allows caterers to automate the calculations and data entry that hold them up each payroll period. Here’s how. Ask anyone in charge of running payroll and they’ll tell you that paper timesheets are the bane of their existence. They’re imprecise, easy to lose, and create hours of work in manual data entry when it’s time to run payroll. That’s why modern workforce management software provides electronic time clocks that record the exact times each employee punches in and out, calculates their wages based on the hours tracked, and puts the data in one central location. Caterers in particular should look for providers with specialized time clocks for FOH and BOH staff, as their daily routines for events are quite different. In addition to transcribing staff’s hours from a paper timesheet, lots of HR managers also have to then check the original schedule to confirm that staff didn’t show up too early or late before approving their hours. It sounds easy, but on a day with multiple events and hundreds of shifts, reconciling the schedule and time sheet can take hours. But not if the software you use to track time is the same one you use to schedule. Workforce management software with staff scheduling can speed the approvals process up by automatically checking any tracked hours against the schedule and notifying managers of discrepancies between the two. Managers can scan quickly, examine any entries the software flags, and rest easy knowing their data is accurate. Once they approve their staff’s hours and pay, HR managers then have to configure that data into a spreadsheet their payroll software can make sense of. There’s no standard here -- every payroll provider requires a different format. That’s why it’s crucial you choose a workforce management software that can integrate with your payroll software. That way, once you approve everyone’s time & attendance, all you have to do is export the data, load it into your payroll software, and voila! Payroll is ready to go. If you’re tired of a time-consuming, stressful payroll process, then it might be time to give Nowsta a try. 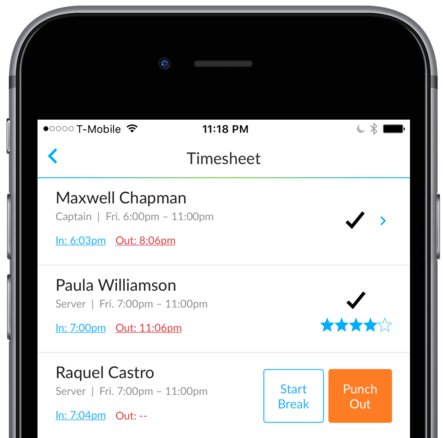 We’re the go-to workforce management provider for caterers and can help you save hours a week on scheduling, time tracking, and payroll. You can learn more and schedule a free demo here.